Since its inception by the late Senator Gaylord Nelson of Wisconsin, Earth Day has been an important part of the environmental movement. The first Earth Day, in 1970, was inspired by Rachel Carson's Silent Spring and the anti-war movement, designed as a teach-in for college campuses and high schools. Thousands of universities and high schools participated. Many wanted the date for Earth Day to coincide with the Vernal Equinox, but Senator Nelson thought otherwise. Senator Nelson chose the date in order to maximize participation on college campuses for what he conceived as an "environmental teach-in". He determined the week of April 19–25 was the best bet as it did not fall during exams or spring breaks. Moreover, it did not conflict with religious holidays such as Easter or Passover, and was late enough in spring to have decent weather. More students were likely to be in class, and there would be less competition with other mid-week events—so he chose Wednesday, April 22. 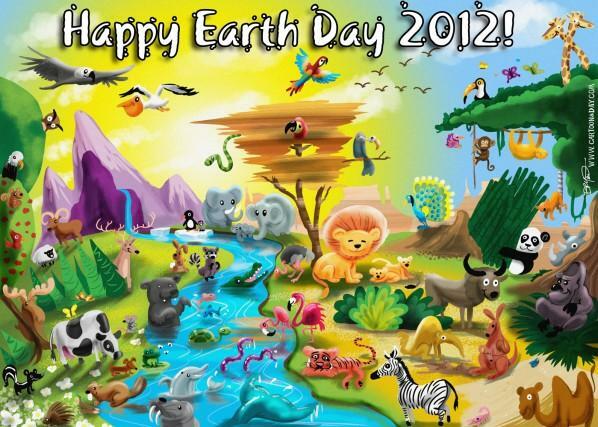 The 22nd of April has also been designated International Mother Earth Day by the United Nations. While the United States produces a significant portion of the world's pollution, we neither produce it all nor can we be responsible for it all. Our planet is more than any small part of itself and all parts need to take responsibility for the byproducts of their decisions. In the 1970s, as I became active in the environmental movement, I planted thousands of trees. Part of this year's promotions is A Billion Acts of Green. While I'm not planting thousands more trees this year, I will be planting tomorrow. Consider what you can plant: trees, ideas, other small acts that make a difference. The small acts add up. Thanks to Dhruv Planet for the closing graphic.